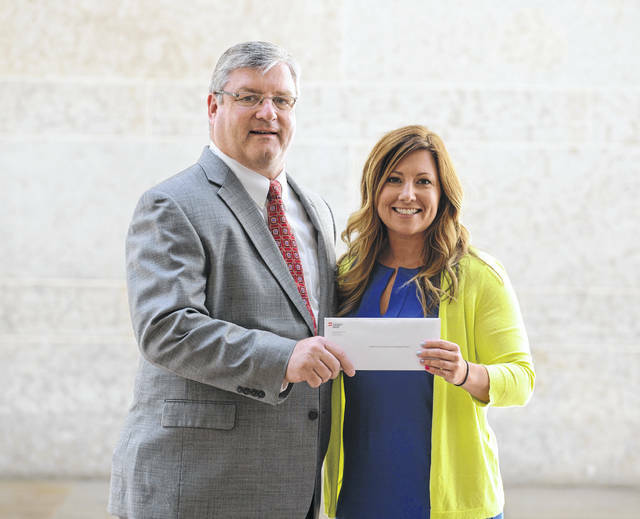 Tim Wells, manager of economic and business development for AEP Ohio, left, presents a grant check to Gallia Economic Development Director Melissa Clark in 2016. GALLIPOLIS — The Gallia County Economic Development Office was recently awarded with AEP Ohio’s LEAP grant in the hopes of spurring economic movement. According to Gallia Economic Development Director Melissa Clark, her office was awarded with $4,660 to be put towards a client management database for two years. Clark said AEP had assisted in funding projects the county might not normally have been able to fund through grants. Clark said the program is geared specifically for economic development offices. The office previously received a Local Economic Advancement Program grant award of $5,000 to assist in the development of an aerial video of marketable industrial properties and highlights of the Gallia County community. The content was incorporated into an already existing marketing plan to be shared with site consultants and business leaders to display a virtual tour of the community. That same video would eventually be recognized with an Economic Development Marketing Award.